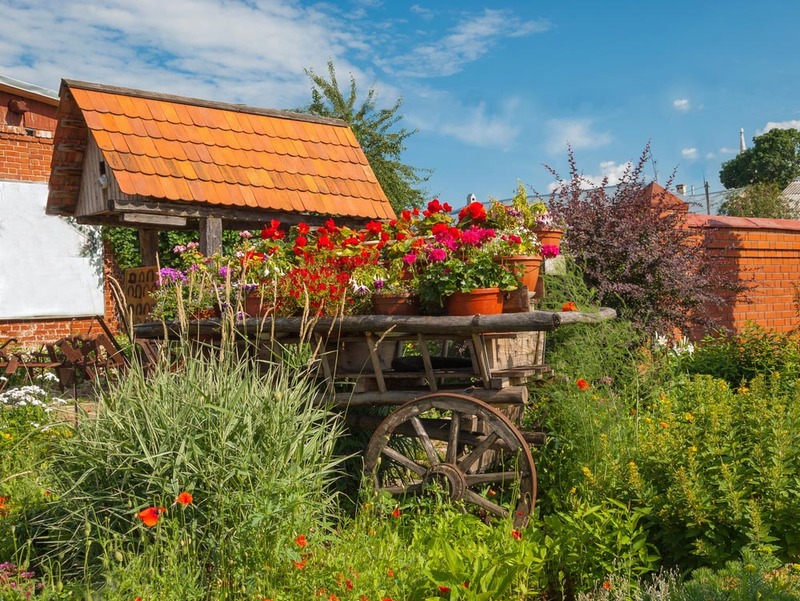 If you're into country style looking scenery, then this rustic garden wagons page will inspire you to add a great look to your garden or backyard. 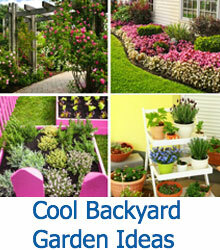 We love garden ideas that repurpose vintage items as decor, and that’s the focus of this gallery! 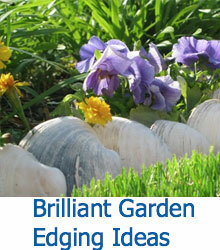 If your style is rustic or country, you may decide you’d like a few statement pieces to add to your garden. 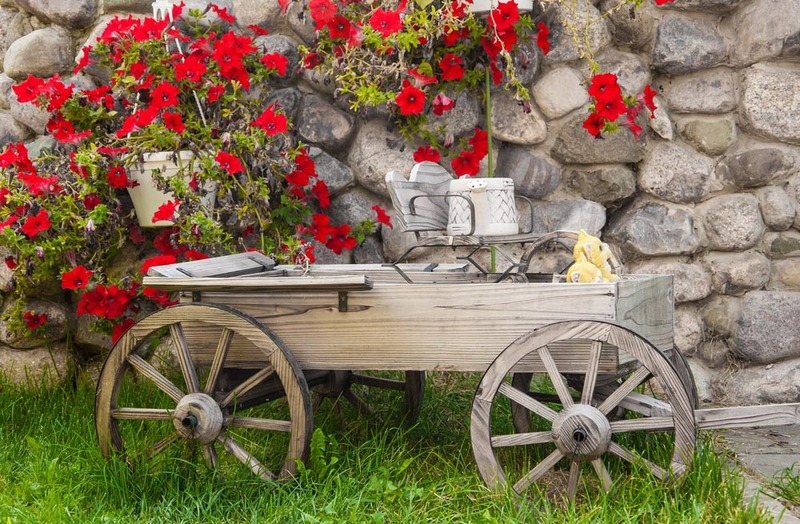 Regardless of whether your garden is large or small, you’re sure to find a great statement piece in the form of a rustic wagon. 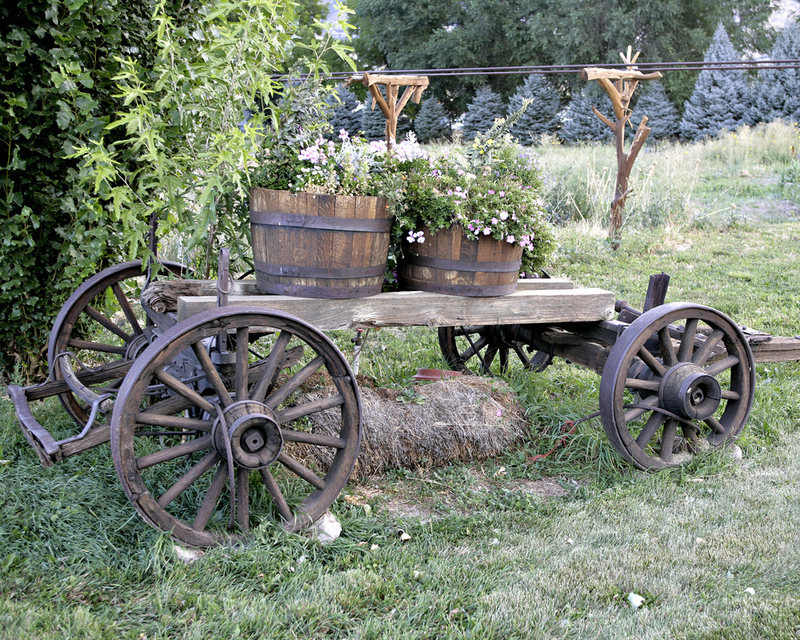 Repurpose an antique wagon originally used for travel or farm work, or build a new one to get the same look. If you have a smaller yard, building a smaller model is a fantastic way to get the country look. 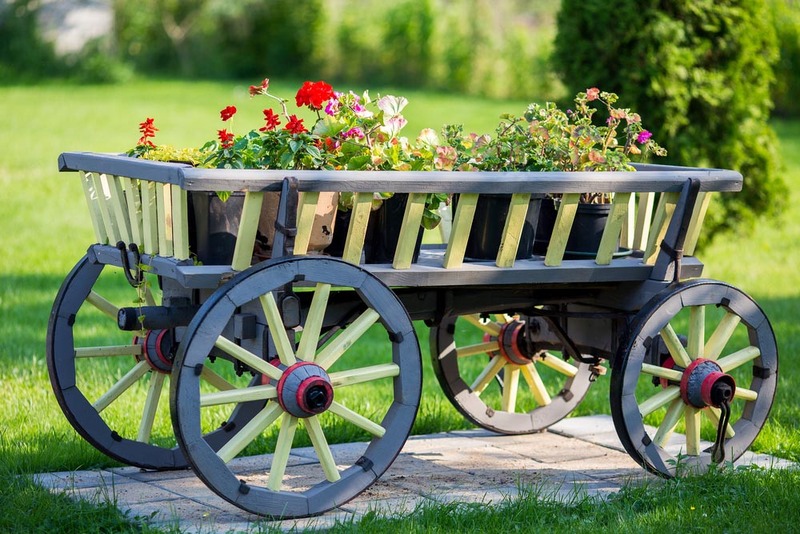 Leave your wagon in a distressed, natural state, or paint it for a newer look. 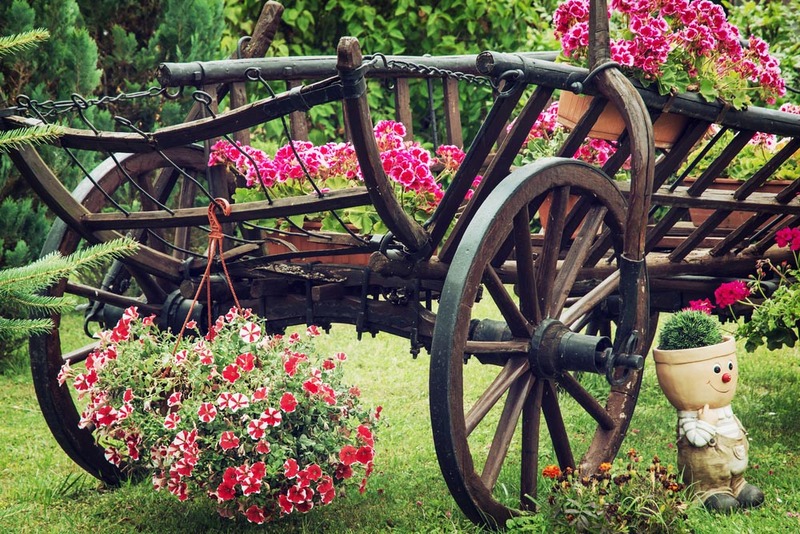 Either way, your new wagon is sure to look great in your garden! 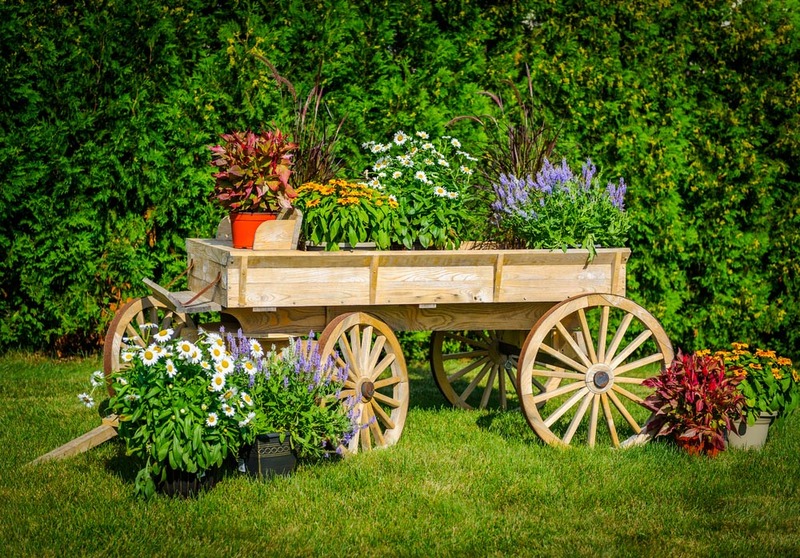 We hope you’ll be inspired to purchase or build a wagon for your garden today! The rustic remains of a covered wagon with intact wheels. 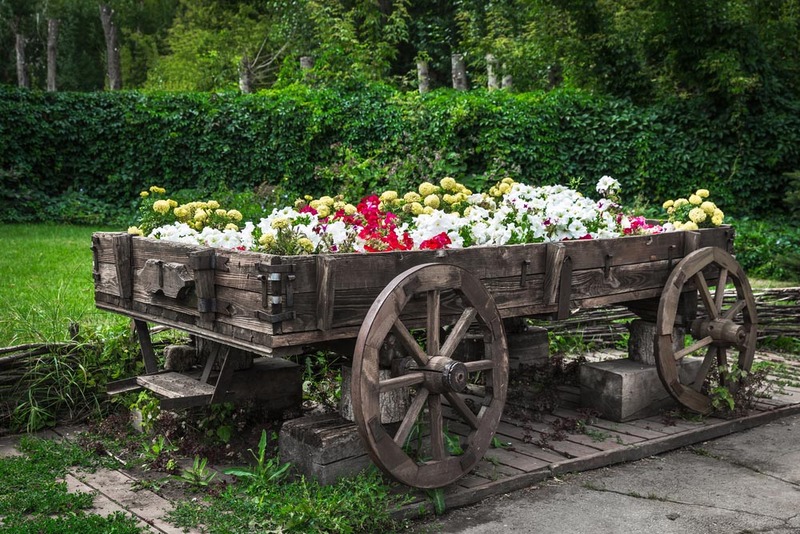 The two supporting beams of the wagon hold up a pair of rustic barrels filled to the brim with lots of greenery and little pastel pink flowers. Below the wagon is a pile of straw, and the whole scene is beside a lovely, full tree. 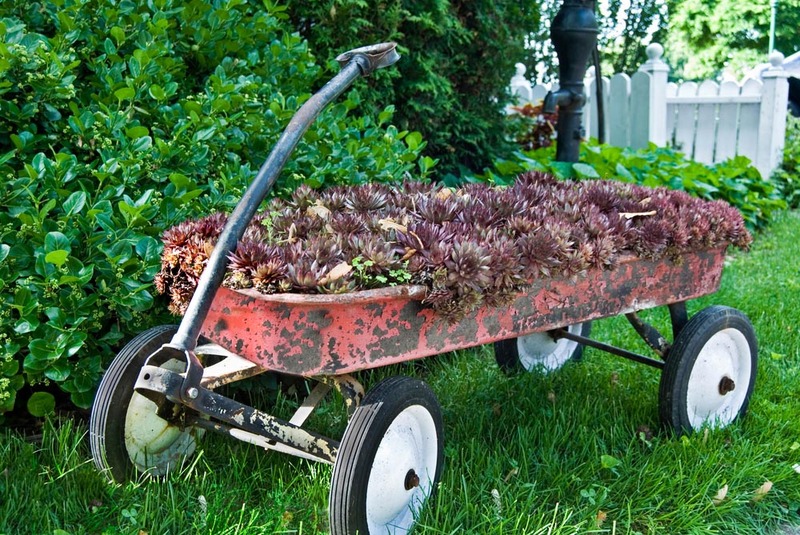 This vintage wagon is sure to have pulled some small children around in the past, but now it has a second life as a large, maneuverable planter for a variety of rusty-red succulents. Just be sure to bring this planter in during a rainstorm so your succulents don’t drown! This wagon might not be old, but it’s been built with exquisite attention to detail, including working wheels and an attached yoke. 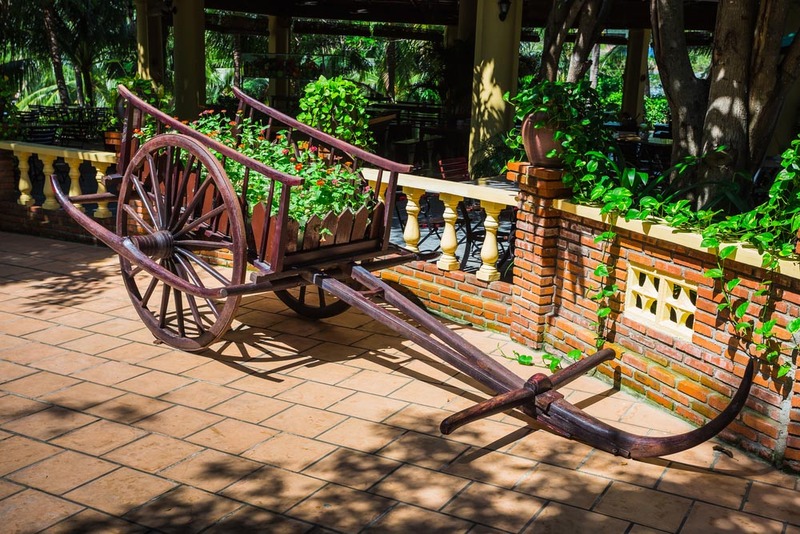 While this smaller wagon would never be used for travel, it does do quite well holding a variety of daisies and lavender in decorative planter pots. This lengthy wagon looks like a hybrid of a traditional wagon and a trough for feeding livestock. The wagon is parked in a large meadow, with an animal shelter and fence in the background. 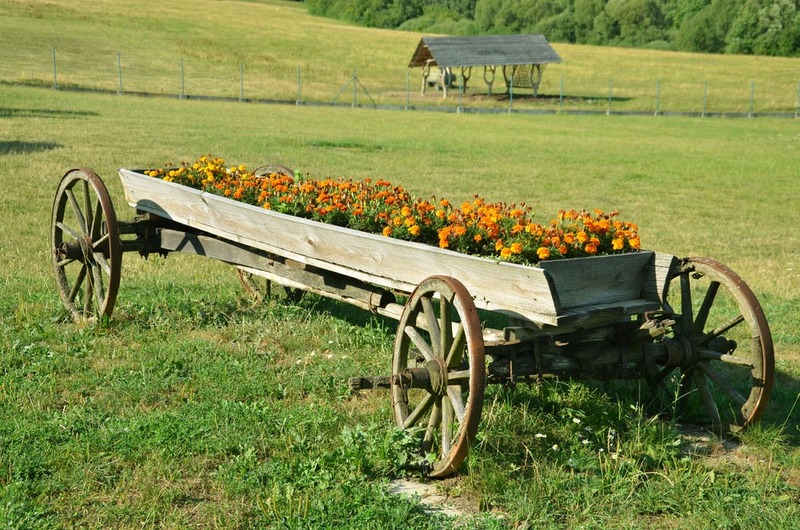 The wagon is filled with a variety of yellow and orange marigolds, which are immensely fragrant. This small wagon was handmade and distressed to appear old and weathered. 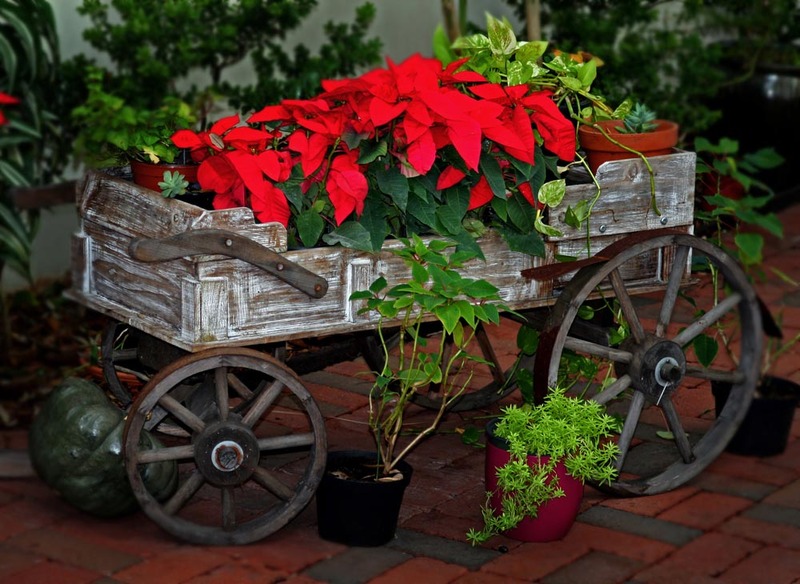 The miniature wagon is filled with potted poinsettias and other greenery, making it a festive choice for the winter holidays. The bottom of the wagon is decorated with other small planters and a gourd. This lengthy wagon is missing most of the sides, but you can still see the ribs of the construction. The bed of the wagon is completely filled with bold red geraniums and a few magenta geranium blooms as well. 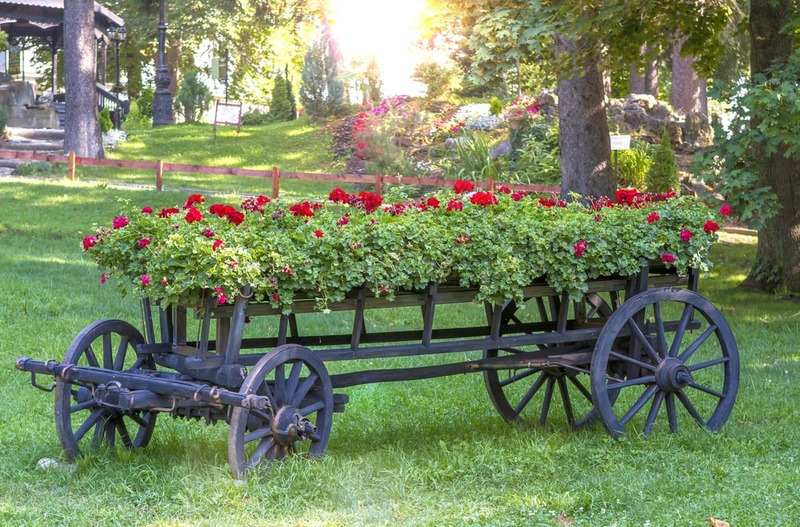 The flowers brighten up this skeletal wagon. A massive antique wagon mounted on a wooden platform and supported by concrete. The whole of the wide bed is planted with white and red petunias and soft yellow marigolds. In the background are large, full hedges and drooping willow trees. This two-wheeled wagon has the yoke attached, and several rusted chains keeping the enormous teal metallic galvanized tub planter on top from sliding out. The planter not only adds color to the display, but supports a wealth of bold red large blooms. A large wagon with picket fencing installed on the inside to support the planters. The wagon is still attached to the yoke, causing the cart to lean forward. The design seems somewhat exotic, with pointed sections of wood throughout the design. 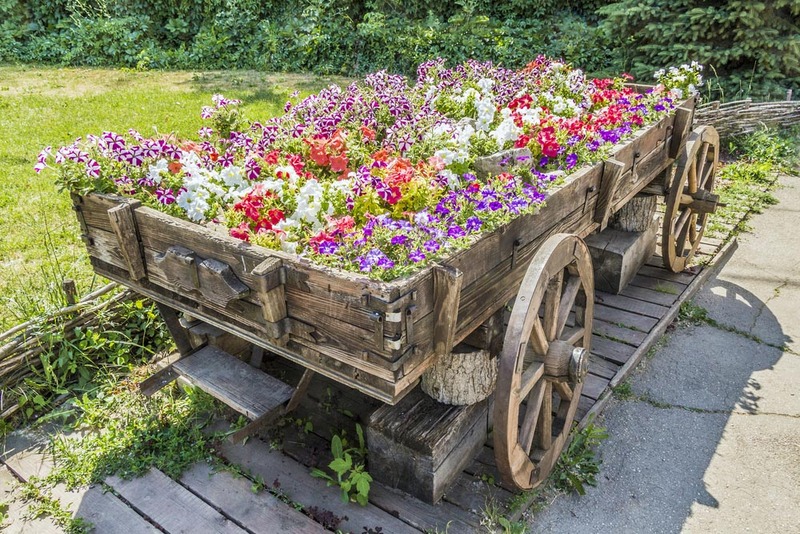 A rustic wagon filled with a variety of petunias in many different colors including purple, red, white, pink, and even multi-colored blooms. A short wattle fence separates the wagon from the meadow and forest beyond. Small plants and weeds grow up between the boards of the wooden platform the wagon sits upon. A rustic wagon with a few pieces replaced with branches. The top of the wagon has tiered risers to display a variety of brightly colored flowers, including petunias. Tall bushes and grasses obscure part of the wagon from view. 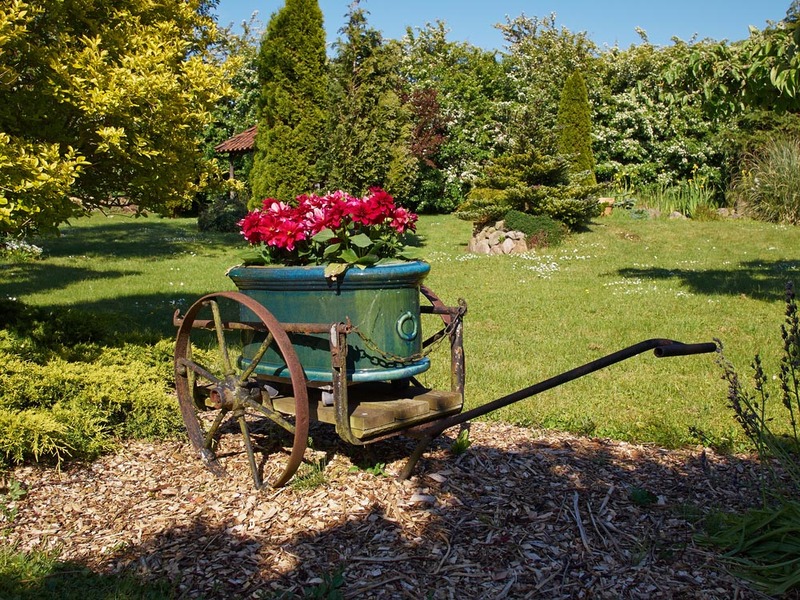 This miniature wagon was built to house the small geranium and other flowers in pots. The wagon was painted to give it a tad more color, and placed on a brick tile platform on the grass. 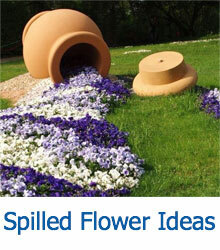 To change the look, simply swap out the current flower pots of new ones. A simple oaken wagon with a minature bench and yoke added on. While the wagon doesn’t house any planters or flowers, it does hold a few stuffed toys. A perfect outdoor toy for the kids or grandkids. A small watering can sits on the seat of the wagon.